Join us for AM Networking sponsored by Robbins Farley at the Gr. Hudson Chamber of Commerce offices on Tuesday, February 26th at 8:30 AM. Robbins Farley is a financial services company with a unique strategy of helping their clients FIND MONEY that is slipping through their fingers unknowingly and unintentionally. 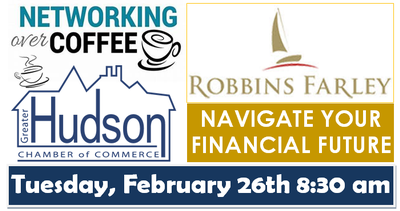 All registered attendees will be eligible to win a gift certificate to Cookie's Cafe sponsored by Robbins Farley LLC as well a chance to win a free ad with the Chamber in the Hudson-Litchfield News! Begin growing your business today! © Copyright 2019 Greater Hudson Chamber of Commerce. All Rights Reserved. Site provided by GrowthZone - powered by ChamberMaster software.